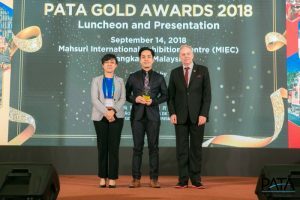 Langkawi (Malaysia) – September 18, 2018 (travelindex.com) – The Pacific Asia Travel Association (PATA) Travel Mart 18, held in Langkawi, Malaysia on September 14, saw the Mekong Tourism Coordinating Office (MTCO) receive reward for its exemplary work in tourism industry marketing for the Pacific Asia region. Winning its second PATA Gold award, the MTCO was recognised for Mekong Moments, a consumer social marketing and travel inspiration platform. The web platform – powered by ENWOKE, a social commerce management solution operated by Chameleon Strategies (Thailand) – collaboratively promotes the Greater Mekong Subregion (GMS) as a single tourism destination in addition to driving direct business to individual business outlets through social commerce. “Mekong Moments is a testament that true collaborative marketing is possible, and powerful to inspire people via shared experience to visit destinations,” said Jens Thraenhart, Executive Director of the MTCO. Working with the public-private partnership framework Destination Mekong, the Mekong Tourism Coordinating Office (MTCO) has driven the esteemed initiative since Mekong Moments became public in 2017. Its booming user participation and successful supporting campaigns has resulted in the MTCO receiving its award for industry marketing excellence, a great honour for all people and organisations involved said Thraenhart. The MTCO was on the winning shortlist gleaned from over 200 entries from 87 separate organisations and individuals worldwide. All winners were carefully selected by an independent judging committee consisting of 14 senior executives from the travel, tourism and hospitality sectors. The Mekong Moments platform exemplifies the true values of our Association in working towards a more responsible travel and tourism industry in the Asia Pacific region, said PATA CEO Dr. Mario Hardy. For the MTCO, the award is yet another accolade earned for the work done on the Mekong Moments platform. The coordinating office also won the prestigious “Golden Citygate Award” for its Mekong Moments’ campaign video at the Internationale Tourismus-Börse (ITB) Berlin in 2017. Mekong Moments is a globally unique and pioneering visual consumer marketing campaign and travel inspiration platform that collaboratively promotes the Greater Mekong Subregion (GMS) as a single tourism destination in addition to driving direct business to individual businesses through social commerce. Regardless of type and size, businesses have encouraged their guests, staff, and stakeholders to share their experiences via their own social media accounts by tagging #MekongMoments as well as the respective hashtag of the experience (hotel, restaurant, destination, attraction, event, tour, shop, etc.). All properly tagged user-generated content is aggregated, which in effect, directs traffic to the corresponding websites of the experiences and/or businesses. Mekong Moments has been carefully planned over two years to meet the requirements of a public-private partnership agreement between six tourism ministries and six companies including IHG, Small Luxury Hotels, Khiri Travel, and Odyssey Tours China with a purpose to create a sustainable and efficient tourism program for the GMS. The initiative is aligned with the Experience Mekong Tourism Marketing Strategy 2015-2020 and the GMS Tourism Sector Strategy 2016-2025. UNWTO Affiliate Member Chameleon Strategies used their web-development technology ENWOKE to build Mekong Moments platform and used significant input from the travel and tourism industry to refine its function and overall purpose. The Mekong Tourism Coordinating Office (MTCO), located in Bangkok, was set up with funding from the governments of the six Greater Mekong Subregion (GMS) countries – Cambodia, the People’s Republic of China, Laos, Myanmar, Thailand, and Vietnam. The MTCO, which operates on annual financial contributions from each GMS country, acts as the secretariat for the GMS Tourism Working Group, comprising of senior officials of the six GMS countries’ National Tourism Organizations, to coordinate and facilitate sustainable tourism development of the GMS in line with the United Nations Millennium Development Goals, and promotion of the Mekong region as a single travel and tourism destination, in collaboration with the public and private sectors. The MTCO manages its award-winning digital platform as a one-stop platform to promote responsible and sustainable tourism in the region, as well as the annual Mekong Tourism Forum, whose hosting is rotated among GMS countries. Destination Mekong was created in 2017 to promote the Mekong region, comprising of Cambodia, PR China (Provinces of Guangxi and Yunnan), Lao PDR, Myanmar, Thailand and Vietnam as a single tourism destination to stimulate responsible and sustainable development and investment, and drive inclusive growth. Endorsed by the Mekong Tourism Coordinating Office and aligned with the mandate of the regional collaborative tourism framework of the six-member governments of the Greater Mekong Subregion, Destination Mekong executes targeted projects and initiatives via public-private partnership investment structures, including Mekong Moments and Mekong Trends, led by UNWTO Affiliate Member Chameleon Strategies.